This Greek Baked Ziti is a delicious and hearty dish that is perfect for making ahead, freezing, and saving for a party or large gathering. 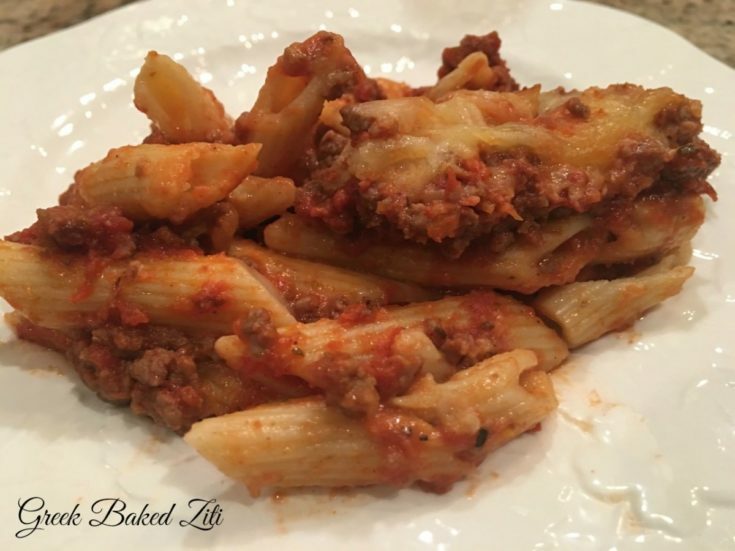 When I saw this Greek Baked Ziti, a Southern Living 2015 recipe, I decided to give it a try. I doubled the recipe, made it ahead, and froze it about a month ago. I thawed, cooked and served it last week at our small group, and it was a huge hit. This dish was inspired by pastitsio, a Greek lasagna. Fresh lemon juice and a touch of cinnamon add a unique and yummy twist on traditional pasta dishes. Everyone noticed the cinnamon but commented on how well it complemented the dish. Make ahead: This dish can be made to the point of baking, frozen, and thawed in the fridge before baking. Since I made a double portion in an extra large aluminum baking dish, I thawed it for three days so that it would bake evenly. Savvy suggestion: Bake covered until all the cheese melts, then uncover just long enough to brown the cheese to golden. Spray the aluminum foil (the part that sits on the ziti) so that it won’t stick to the cheese and pull it off when uncovered. This really makes a unique and delicious dish that is hearty and perfect for serving at a party. We served it with a large salad, yeast rolls and dessert, and everyone loved it. For another great ziti recipe that is perfect to make for a crowd, you might try this crowed pleasing baked ziti. If you try this, I’d love to hear how you like it. As always, thanks so much for stopping by. Be blessed, and stay savvy!!! Meanwhile, sautÃ© onion in hot oil in large skillet over medium-high heat 4 to 5 minutes or until tender. Add garlic; sautÃ© 30 seconds. Add beef; cook, stirring occasionally, 5 minutes or until crumbled and no longer pink. Drain mixture, and return to skillet. Stir tomato sauce, next 4 ingredients, and 1 tsp. salt into meat mixture. Bring to a simmer over medium-high heat, and cook, stirring occasionally, 2 minutes. Remove from heat. Melt butter in a large saucepan over low heat. Whisk in flour, and cook, whisking constantly, 2 minutes. Gradually whisk in milk. Increase heat to medium, and cook, whisking constantly, 5 to 7 minutes or until thickened and bubbly. Stir in Parmesan cheese, pepper, and remaining 1/2 tsp. salt. Add sauce to pasta, stirring to coat. Transfer pasta mixture to a lightly greased (with cooking spray) 13- x 9-inch baking dish. Top with beef mixture, mozzarella cheese, and breadcrumbs. Bake at 350Â° for 20 to 25 minutes or until mixture is bubbly and cheese is melted. Let stand 10 minutes before serving. MAKE IT AHEAD Fix and freeze this dish (unbaked) for a hands-off dinner. Let it stand 30 minutes before baking, and add 15 to 20 minutes in the oven.